1. What is a depth map? A depth map is a greyscale image where the brightness of each pixel corresponds to the depth (or height) of the object at each point. The standard sim/axis.ini configuration file is already configured this way. Verify all the settings in the right-hand column, then press OK to create the gcode. Depending on the image size and options chosen, this may take from a few seconds to a few minutes. 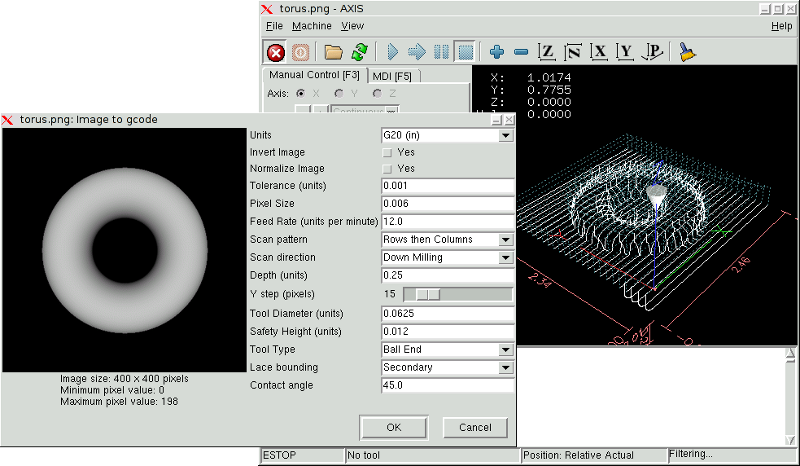 If you are loading the image in AXIS, the gcode will automatically be loaded and previewed once image-to-gcode completes. In AXIS, hitting reload will show the image-to-gcode option screen again, allowing you to tweak them. Specifies whether to use G20 (inches) or G21 (mm) in the generated g-code and as the units for each option labeled (units). If “no”, the black pixel is the lowest point and the white pixel is the highest point. If “yes”, the black pixel is the highest point and the white pixel is the lowest point. If yes, the darkest pixel is remapped to black, the lightest pixel is remapped to white. If None, the input image is used as-is, and details which are at the very edges of the image may be cut off. If White or Black, then a border of pixels equal to the tool diameter is added on all sides, and details which are at the very edges of the images will not be cut off. When a series of points are within tolerance of being a straight line, they are output as a straight line. Increasing tolerance can lead to better contouring performance in LinuxCNC, but can also remove or blur small details in the image. One pixel in the input image will be this many units—usually this number is much smaller than 1.0. For instance, to mill a 2.5x2.5-inch object from a 400x400 image file, use a pixel size of .00625, because 2.5 / 400 = .00625. The feed rate for the initial plunge movement. The feed rate for other parts of the path. The spindle speed S code that should be put into the gcode file. The top of material is always at Z=0. The deepest cut into the material is Z=-depth. The diameter of the cutting part of the tool. The height to move to for traverse movements. 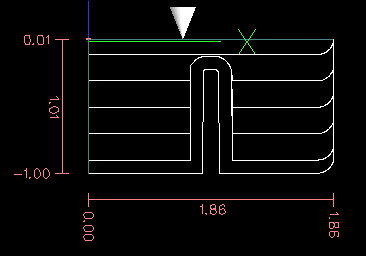 image-to-gcode always assumes the top of material is at Z=0. None: Rows and columns are both fully milled. Secondary: When milling in the second direction, areas that do not strongly slope in that direction are skipped. Full: When milling in the first direction, areas that strongly slope in the second direction are skipped. When milling in the second direction, areas that do not strongly slope in that direction are skipped. When Lace bounding is not None, slopes greater than Contact angle are considered to be strong slopes, and slopes less than that angle are considered to be weak slopes. Image-to-gcode can optionally perform rouging passes. The depth of successive roughing passes is given by Roughing depth per pass. For instance, entering 0.2 will perform the first roughing pass with a depth of 0.2, the second roughing pass with a depth of 0.4, and so on until the full Depth of the image is reached. No part of any roughing pass will cut closer than Roughing Offset to the final part. The following figure shows a tall vertical feature being milled. In this image, Roughing depth per pass is 0.2 inches and roughing offset is 0.1 inches.